The growing momentum of algae as an ingredient in food and drink innovation marks a milestone in the evolution towards more plant-centric eating. Algae have been gaining more attention as a functional food in recent years. Their nutritional profile make them uniquely suited to meet the demands of consumers who are exploring more plant-centric diets. While varying between species, algae generally feature high mineral and vitamin content, and are rich in fibre and polyunsaturated fatty acids (omega-3 and omega-6). Algae are also considered a sustainable food source for animals and humans. The plants are found in almost every ecosystem in the world, and they grow much faster than many traditional crops such as wheat and barley. Certain species of algae do not even require fresh water, but thrive in saline conditions. This is a huge advantage over traditional agriculture, which uses vast quantities of fresh drinking water. While more established in Asia, the use of algae as a source of fuel for the human body in the Western market is still its infancy. Yet, the share of algae-containing food and drink launches in Europe has grown over the past few years, from 0.6% between October 2012 and September 2013 to 1.4% between October 2016 and September 2017. Microalgae spirulina accounted for almost two thirds of such launches, as it’s often used as a natural food colour. Algae are gaining popularity as a superfood across food and drink categories, both as a base ingredient and as an added flavour in premium-positioned launches. Its natural green colour means that it can be used to achieve or support an image of health alongside other literally “green” ingredients such as kale or wheatgrass. While finding a natural home in smoothies, algae are also infiltrating other drink categories, such as flavoured water and spirits. Moreover, launches of algae-based burgers, steaks and sausages are slowly gaining traction in Europe. 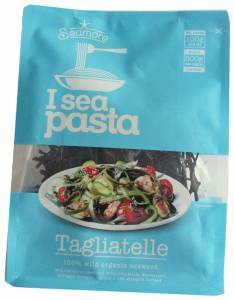 Seamore I Sea Pasta, Netherlands: This wild organic seaweed from Connemara, Ireland, is hand picked and dried. It comes in the shape of tagliatelle and provides a low-carb, low-calorie, gluten-free, ‘seastainable’ and vegan-friendly alternative to pasta. 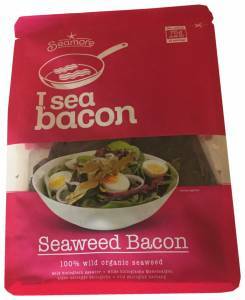 Seamore I Sea Bacon Wild Organic Seaweed Bacon, Netherlands: This dried, organic seaweed is marketed as an alternative to bacon, and it can be put on anything that deserves a crunchy, salty and smoky kick. 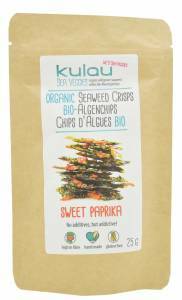 Kulau Organic Seaweed Crisps with Sweet Paprika, Germany: These dried and not fried seaweed crisps are naturally rich in iodine, high in fibre and gluten-free. According to the manufacturer, the seaweed is carefully hand-picked by a small manufacturer in the Galician coast. 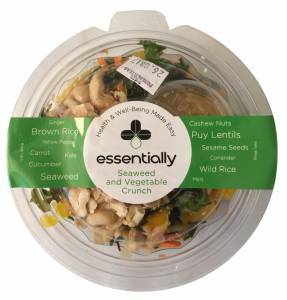 Essentially Seaweed and Vegetable Crunch Salad, Norway: Described as an original, innovative ready-to-eat salad, this product contains brown rice, lentils, seaweed, ginger and cashew nuts. 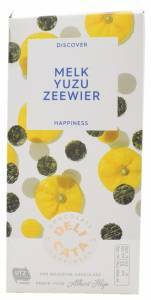 Albert Heijn Delicata Yuzu and Seaweed Milk Chocolate Tablet, Netherlands: According to the manufacturer, this chocolate tablet is made with innovative flavours that challenge and inspire chocolate lovers with unexpected ingredients. Smart Chimp Coconut Flavoured Spirulina Antioxidant Water, France: This flavoured water is naturally blue thanks to the fresh spirulina, a blue micro-algae which contributes to reduce oxidative stress effects. Crafty Distillery Hills & Harbour Gin, UK: This gin contains noble fir needles and bladderwrack seaweed, and is balanced with nine other botanicals to give it a complex and refreshing taste. Hohes C Hoch2 Strengthen Yourself Smoothie with Apple, Kiwi, Avocado, Chlorella Algae and Spinach, Germany: This mix of fruit juice, vegetable puree and chlorella algae contains vitamin B12, which supports the nervous system, and it’s rich in vitamin C, which strengthens the immune system and combats fatigue and tiredness.